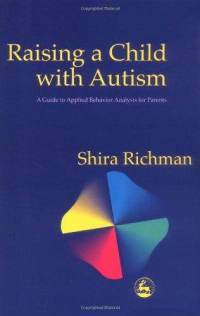 Raising a Child with Autism: A Guide to ABA for Parents by Shira Richman. The author explains how parents can adapt the practical techniques used in ABA for use at home. Tips to enhance play skills, improve communication and sibling interaction and increase independence are provided. The book also covers toilet training, food selectivity, self-dressing and community outings. It includes an overview of the theory behind ABA as well as a list of resources for further reading. Pp. 157. This entry was posted in Behavior Modification, Interventions, Our Library and tagged Autism Spectrum Disorder, books, life skills, social skill. Bookmark the permalink.